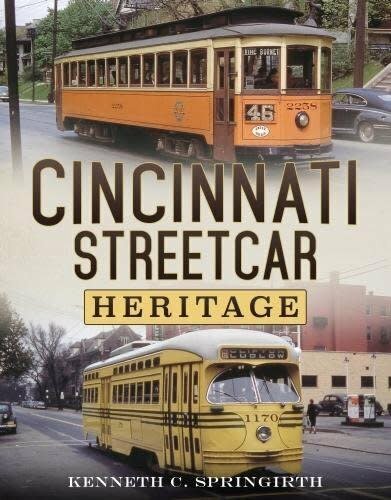 Cincinnati Streetcar Heritage is a photographic essay of the Cincinnati, Ohio, streetcar system. Cincinnati's first electric streetcar line was the conversion of the Mt. Adams & Eden Park Inclined Railway Company cable car line to electric operation in 1888, which became part of the Cincinnati Street Railway Company in 1896. Because of concern over corrosion of underground conduits and water pipes, Cincinnati's streetcar lines were required to have a double overhead wire within city limits. Cincinnati, along with Merrill, Wisconsin, and Havana, Cuba, were the only streetcar systems in North America with a double overhead wire system. Two open observation streetcars were placed in sightseeing service during 1939. The only Presidents' Conference Committee (PCC) cars ever built with two trolley poles were operated in Cincinnati. 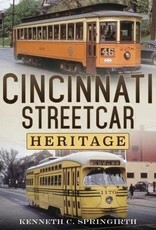 Although Cincinnati's streetcars made their last run in 1951, the Toronto Transit Commission purchased 52 of Cincinnati's PCC cars with the last one taken out of service in 1982. Cincinnati Streetcar Heritage documents the city's streetcar era, including the Cincinnati Bell Connector streetcar line which opened in 2016, linking downtown Cincinnati with the Over the Rhine neighborhood.